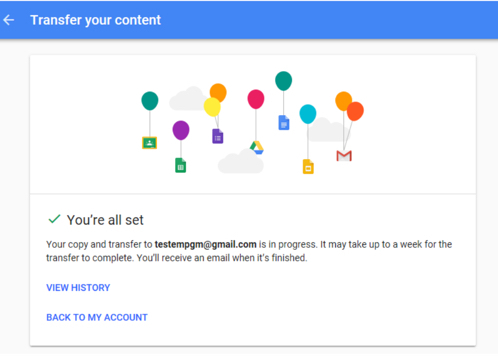 Google provides a tool that will copy UW Gmail email messages and My Drive files to a personal Gmail account. This tool allows you keep your UW Gmail email messages and My Drive files when you leave the University of Washington. Please note: Instructions to migrate Contacts from your UW Gmail to a personal Gmail account are provided below the instructions for copying UW Gmail email messages and My Drive files to a personal Gmail account. Before copying any data, please review the UW-IT Appropriate Use webpage and note that while UW Gmail and My Drive are FERPA compatible, personal Gmail accounts are not. To copy files that other people have shared with you, add those files to your UW My Drive. When you make a copy of your UW Gmail messages and My Drive files, the original messages and files stay in your UW Gmail account and My Drive. Any changes you make to the copied email messages and files in your personal Gmail account don’t affect the originals in your UW Gmail and My Drive. Each time you copy UW Gmail email messages and My Drive files to your personal Gmail account, a new copy of the content is created in your personal Gmail account and My Drive. Note: The following guide is to copy your UW Gmail email messages, My Drive files, and contacts to a personal Gmail account. 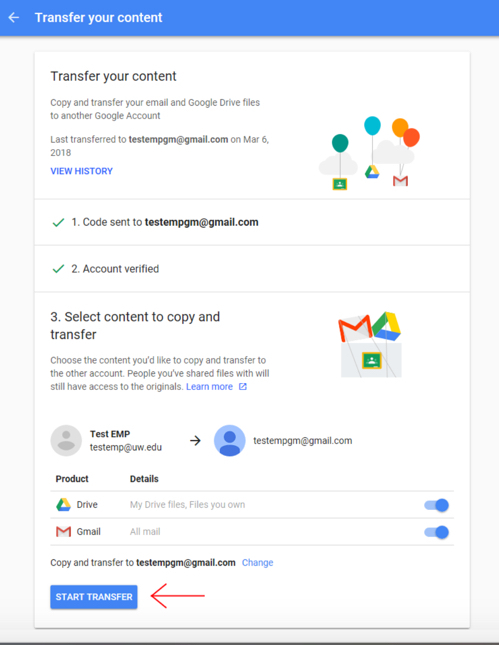 If you’d like to export a copy of all your UW G Suite account content to an archive file, see these instructions from Google. Note: You will be using two different browsers during this process. We recommend using Google Chrome (free download), Mozilla Firefox (free download), Safari (pre-installed on Mac), or Edge (pre-installed on Windows 10). In your first browser (e.g. Chrome), if you haven’t already created a personal Gmail account, navigate to this URL to create a personal Gmail account: https://accounts.google.com/signup. Now, in your second browser (e.g. Firefox) log in to your UW Gmail account by navigating to this URL: https://gmail.com and entering your UW email address. You will then be prompted to log in with your UW NetID credentials. Once you see your UW Gmail inbox, open a new browser tab in the same browser (Firefox) and navigate to this URL: https://takeout.google.com/transfer. Follow the directions on the page starting with Step 1. Enter your personal Gmail email address and click the Send Code button. You will receive a notice from Google to check your personal Gmail account for a confirmation code sent by Google. You can check your personal Gmail account by opening the first browser (Chrome). 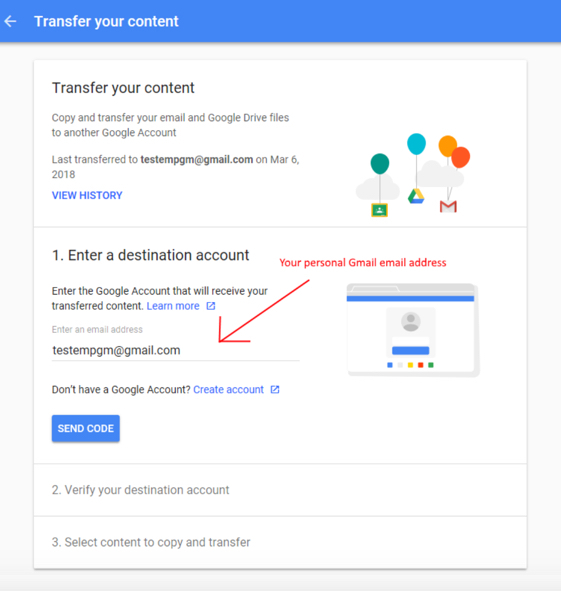 Open the email from Google to verify your personal Gmail account and follow the directions in the email. Copy the verification code you are presented with then paste that code back in the Transfer your content browser tab (Firefox) and click Verify. 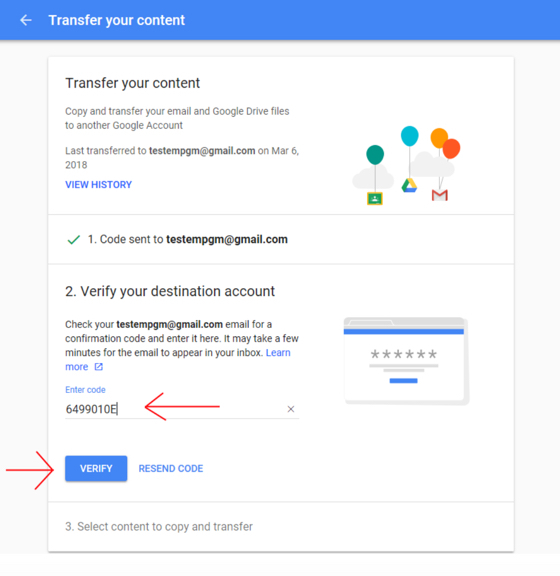 Once you click Verify, you will be presented with a confirmation of the source UW Gmail account and the target personal Gmail account for the content copy and transfer. You are also presented with an opportunity to select the content you want to transfer. By default, both the Drive and Gmail content options are selected as content to be copied and transferred. You cannot copy individual or subsets of email messages, files, or folders. You can either copy and transfer all or none of your email messages and files. Once you’ve confirmed the content you want transferred, click Start Transfer. You will then see a You’re all set message from Google stating that the copy and transfer is in progress and may take up to a week to complete. You will receive an email when it is finished. Once your email has been copied to your personal Gmail account (Chrome), note that each email message receives a Gmail label with the date and time the message was transferred as well as a label with your UW email address. Sent mail from your UW email address can be found in your personal Gmail address under the Sent Mail label. Transferred email messages maintain their original date and time. Copied and transferred UW My Drive files appear in a single folder in your personal Gmail My Drive in a folder with name of your UW email address and the date and time of the transfer. The individual files have a Last modified attribute of the date and time they were transferred. Repeat this process at any point in the future to make a new copy of your UW Gmail and My drive. In your second browser, where your UW Gmail account is logged in (e.g. Firefox), on this page under Import contacts, from a Gmail account, follow step 1 to export your contacts to a CSV file. In your first browser, where your personal Gmail account is logged in (e.g. Chrome), on the same page under Import contacts, from a Gmail account, follow step 2 to import your contacts from the CSV file. In your first browser (Chrome), in your personal Gmail account inbox, click the gear symbol in the upper right corner, then click Settings. Click the Accounts and Import/Accounts tab. In the Send mail as section, click Add another email address. Enter your UW email address and click Next Step. For SMTP Server, enter: smtp.uw.edu. For Username, enter your UW email address. For Password, enter your UW NetID password. Select Secured connection using TLS (recommended). Now, in the other browser (Firefox) check your UW Gmail account (Firefox) for an email from Gmail that says “Gmail Confirmation.” Copy the confirmation code from the email. In Chrome, open your personal Gmail account, paste the confirmation code in the text box, then click Verify. You will now be looking at the Accounts and Import tab under Settings, and you can see your UW email address listed under Send mail as. You can adjust the When replying to a message default behavior. Click the red Compose button on the left side of the page to compose a new email draft. On the From line, you can select which email address you’d like to send from – your personal Gmail address or your UW email address.